Froyle Wildlife group was formed in 2014 partly as a follow on to a Parish Plan idea for a ‘wildlife club’. It aims to encourage awareness of local biodiversity and to enhance it. Also to involve the community in practical nature conservation tasks and in recording local wildlife species. Anyone with an interest in wildlife is welcome to join. In 2017 we became a registered charity. Link to our ‘Walks and Talks’. Link to our projects and recording. 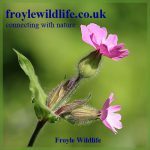 Froyle Wildlife Registered Charity Number 1171997.